As well as providing a discussion group where guild members could discuss topical issues, there was also a strong social side to the societies. Many Edinburgh guilds had choirs and elocution lessons were provided in Stockbridge, Morningside and Murrayburn. In the autumns the Gorgie branch held a night when the members were entertained by an accordion player and could have a dance. Many guilds also held Burns Suppers. From the very beginning of the movement there was a desire amongst its members to open a convalescent home where members could stay to recover from an illness. Early efforts were based in Glasgow and resulted in the opening of a home at West Kilbride in 1896. 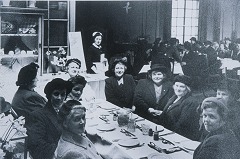 Further homes were opened throughout Scotland at Galashiels, Dunoon, Largs and North Berwick, where the SWCG operated Redholme House for members. By the end of the Second World War, the society had reached the height of its membership. From 1947-1951 there was a loss of almost a quarter of the movement's membership. This rapid decrease in membership has continued and as a result branches have closed, until what is left is a mere fraction. Midlothian, for example, has only one guild left, in Newbattle, and it is reduced to a handful of elderly members. Section IV, which encompasses Edinburgh and the Lothians, controls only fourteen branches (not counting the independent Musselburgh and Fisherrow Branch). Some of the reasons are obvious - alternatives now exist in abundance and the parent co-operative societies have themselves changed - but without new blood the guilds may vanish from the Scottish social and political scene.